These reels take performance to an entirely new level with an all-new reduced-weight frame design. 10 PT hybrid bearings and the revolutionary TiMag bail system combine to give the angler a lifetime of trouble-free performance. Quantum proprietary LMS Line Management System allows the line to flow more freely from the spool during casts. Features include a TiMag titanium bail with magnetic trip, MAGLOK continuous anti-reverse, and a stacked ceramic drag. Free spare aluminum spool included. "I would like to start by saying, quantum does NOT HONOR there rebates!!! I bought 3 energy, 3 accurist, 1 tour baitcast reels and 3 energy spinning reels and didnt recieve a dollor in rebate cash back!! 30$ FOR EACH REEL!!! 300$ IN REBATES!!!" "Not a bad reel at all. Very smooth and can bring in the big bass. Although a little pricey, i think its worth it." "this reel is a great reel to own this made my summer alot better super smooth!" 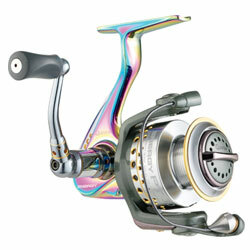 "a great reel a little bit heavy but that is all nice drag system and plus its PREETY to look at just look at it"